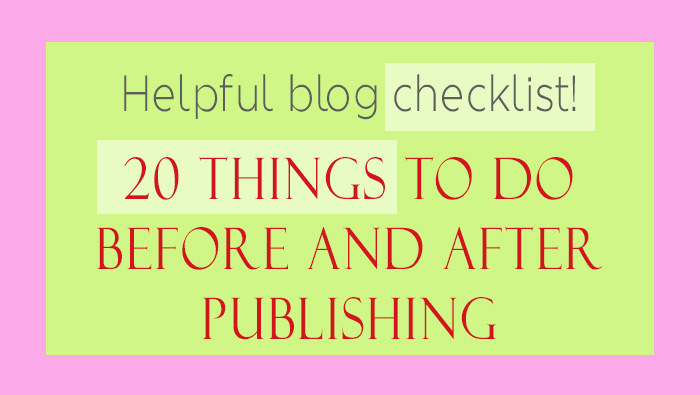 If you want people to notice your blog post, there are several important things to do both before and after you hit ‘Publish’. I made a checklist for myself so I don’t need to wonder every time if I have forgotten something. And then thought that surely others would benefit from that list too! In this post I’m not talking about the actual writing of the post at all. These are things you need to do apart from the content! You may not always do all of these, although I try to do all with every post I publish. Create a featured image if you use one. Check that the post is in correct categories. Check that the correct widgets are showing when the post is selected. Check that the post url is right and tells readers exactly what the post contains. Many times I have published a post, only to realise that I had improved the title several times and the url was the first version of the title. Write a catchy meta description. I use the Yoast SEO plugin. It has a specific space for your description, Edit snippet. Check out the other SEO points Yoast SEO suggests. Add alt texts and titles for all images. Use keywords that go with the subject of the post. Check that all post image files have file names that reflect the image and/or the subject of the post. Check your grammar and spelling on Grammarly. Create a Pinterest image. A good size for a basic pin is 735 x 1200 pixels. I make mine either in Photoshop or the free Gimp. Right now I’m working on a free email course on Gimp. I will add it to the blog and let all subscribers know when it is available. Add the Pinterest image to the post. If there are affiliate links in your post, add rel=”nofollow” to all the link codes. This is important because of search engine optimization. Share the post on your blog’s Facebook page. Share the Pinterest image to your blog Pinterest board first. Make sure you have the post itself open when you share, not a list of posts. Otherwise the link won’t go directly to the post. Write a good pin description that explains clearly what the pin contains. Remember to use relevant hashtags in the description. Automate the pin to all relevant group boards using either Tailwind or BoardBooster or both. With my Tailwind link you get a free month if you upgrade to the paid version of Tailwind. Mention the new post in Facebook groups that allow sharing. Make sure to do that according to each group’s rules. Don’t spam but take part in discussions and help people with your ideas and knowledge. Automate tweets about the post over the next few days. I use Hootsuite. Create those tweets in between other tweets not to annoy your followers with repeating content. You can also use the Click to tweet plugin to make it easy for anyone to share your posts in Twitter. Create several Instagram images about the post and spread those out. Make an Instagram story about the post if applicable. I haven’t mentioned your email list in this context because there are so many different ways to deal with blog posts in emails to your list. Need help with creating or improving your blog? I used to be a web design teacher for many years but I’m not doing that work anymore. Therefore I was happy to find an awesome course that teaches all the basics of creating a blog. Even if you already have a blog but want to improve it, this is a great course. Check out Blog by number.